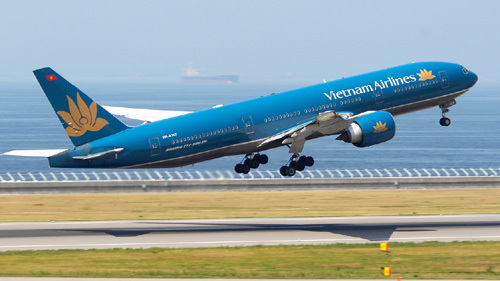 Vietnam Airlines on September 15 announced a codeshare pact with Jet Airways of India for jointly sharing passengers to provide them seamless connections on direct flights from Vietnam to India, easily facilitating one-stop ticketing and baggage check-in. The agreement was signed by Pham Ngoc Minh, General Director of Vietnam Airlines Corporation and Naresh Goyal, founder and Chairman of Jet Airways-India’s premier airline within the framework of the current state-level visit of Indian President Pranab Mukherjee to Vietnam. Under the agreement, Vietnam Airlines will team up with its Indian partner on flights Singapore – Mumbai/Delhi/Chennai, Bangkok/Hong Kong – Mumbai/Delhi and Jet Airways’ newly launched Delhi – HCM City via Bangkok. In turn, Jet Airways will share Vietnam Airlines’ flights between Singapore/Bangkok/Hong Kong – Hanoi/HCM City and Vietnam Airlines’ newly launched Singapore – Phu Quoc (Vietnam). The codeshare flights are part of the two airlines’ plan to open a direct air route between the two countries in the future./.